IMPORTANT! 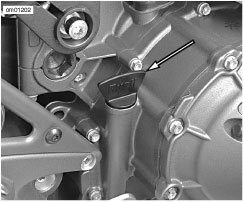 Please note: Thru at least April 8th, 2008, Buell 1125R Owner's Manuals contain errors in the procedure specified for checking engine oil level. Buell is furnishing the corrected version in the online 1125R Owner's Manual available on www.Buell.com. The correct procedure is basically to check the level as specified except with the bike held upright/vertical rather than resting on the sidestand. The correct total oil capacity is 3 quarts (2.8 L). Please do not put more than 3 quarts (2.8L) of oil into your Buell 1125R motorcycle. Please note that though total oil capacity is 3 quarts, some oil will remain in passages and coating surfaces of the engine and transmission, so no more than 2.7 quarts (2.6 L) should be required during any routine oil change. An accurate engine oil level reading can only be obtained with the engine at normal operating temperature (hot check). The engine will require a longer warm up period in colder temperatures. For pre-ride inspection, simply verify that there are no oil leaks from the oil filter cover or oil lines prior to operating the motorcycle. Ride motorcycle for approximately 10 minutes. Ride at least 5 miles 8 kilometers to ensure the oil is hot and the engine is at normal operating temperature. Readings taken with colder oil could lead to an overfull engine condition.. Hold motorcycle upright and vertical on firm level ground. An uneven surface will produce a false oil reading.. Idle the motorcycle for three minutes. Shut off the motorcycle.. 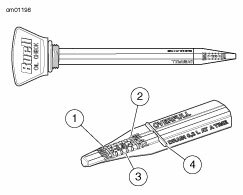 Wait for three minutes after shutdown before reading the oil level, or false readings may result..
Unscrew and remove dipstick from oil filler hole. Wipe dipstick clean..
Insert dipstick into oil filler hole, screwing dipstick in completely..NOTE: Refer to Recommended Engine Oils. Use only recommended oil specified in Engine Lubrication: Buell 1125R Models..
Unscrew and remove dipstick and note oil level. An indicated oil level between MIN and MAX (measured after performing steps 1 through 6) is acceptable for safe engine operation. Oil should be added in 3 to 7 fl. oz. (100 to 200 mL) increments, depending on how far the level is from the MAX reading. Confirm oil level by repeating steps 5 through 7..NOTE: If the oil level is at (or above) the OVERFULL mark, drain oil at 7 fl. oz. (200 mL) increments until the oil level is between the MIN and MAX marks on the dipstick. Repeat steps 1 though 7 to confirm proper level..
Hand tighten dipstick into oil filler hole. Thanks to BadWeBr Xb9 for sharing the following vital information. You rock David! An accurate engine oil level reading can be obtained with the engine cold or at normal operating temperature. The engine will require a longer warm up period in colder temperatures if using the hot check procedure. NOTE: For an accurate cold check, you must wait a minimum of four hours after the motorcycle has been run. 1. See Figure 1. Loosen the dipstick. 2. Hold the motorcycle upright for one minute. 3. While continuing to hold the motorcycle upright, remove and wipe off the dipstick. 4. Insert dipstick into oil filler hole, screwing dipstick in completely. 5. See Figure 2. Unscrew and remove dipstick and note oil level. An indicated oil level between MIN and MAX is acceptable for safe engine operation. Oil should be added in 3.4 fl. oz. (0.1 L) increments, depending on how far the level is from the MAX reading. If oil was added, proceed to the Oil Level Hot Check procedure. 1. Ride motorcycle for approximately 10 minutes. Ride at least 5 miles (8 kilometers) to ensure the oil is hot and the engine is at normal operating temperature. Readings taken with colder oil could lead to an overfull engine condition. 2. Stand the motorcycle upright (not leaning on sidestand) on a firm level surface. An uneven surface will produce a false oil reading. 3. Idle the motorcycle for three minutes. Shut off the motorcycle. 4. See Figure 1. Loosen the dipstick. 5. Wait for 3-4 minutes after shutdown (with vehicle still upright) before reading the oil level, or false readings may result. 6. Unscrew and remove dipstick from oil filler hole. Wipe dipstick clean. 7. Insert dipstick into oil filler hole, screwing dipstick in completely. 8. See Figure 2. Unscrew and remove dipstick and note oil level. An indicated oil level between MIN and MAX (measured after performing steps 1 through 7) is acceptable for safe engine operation. Oil should be added in 3.4 fl. oz. (0.1 L) increments, depending on how far the level is from the MAX reading. Confirm oil level by repeating steps 1 through 8. When a mule begins to pull as desired, you don't then commence beating the poor beast for taking so long to do so. You offer encouragement and positive reinforcement, yes along with further positive admonitions to continue to giterdone! Yes? I guess I'm just getting Rotax fever. I have even found myself checking out Apriia's. I would prefer to get an American made Buell with a Rotax so I watch closely so I read as much as I can. The online manual has finally been updated with the correct oil level check procedures. That occurred over a month ago. Oops, looks like I'm behind the curve again! Someone please pass this up the chain. If this has been posted already I am sorry, could not find it. On a related note what is the part number for the aluminum crush washers used on the drain plugs??? Anyone having oil consumption issues? Mine was .6L low at 2200 miles. Level was correct at the 600 mile service. Hmm, mine has been just fine. As far as oil level checking procedures it is not much different than a lot of other bikes I have owned. There is a specific scenario that needs to exist to determine if the oil level is correct. My Honda ST1300 is not much different than this procedure except, it has a sight glass. The real issue is trying to see the sight glass with all the tupperware! I followed the "updated" oil check procedure to the t and there was a full quart-reading's difference between hot and cold. Cold barely touched the bottom of the stick, hot was almost at the overfill mark. Anyway... Is there anyway to change to oil without spilling it everywhere??? Son of a... I think I'm going to stop following the procedure and change it on the rearstand from now on. I assumed I'd change it on the kickstand as prescribed in the manual because then the bike would be properly leaned for full drainage on the left side (and for the filter) and then also from the kickstand you can more easily tilt the bike to the right for the right side plug. Which would be impossible with the rearstand. But son of a.. on the left side it drains down the kickstand and then on the right side it pours on the pipe! I think 2.9 quarts of oil are on my garage floor. I want my spin on filter! Everybody has to have a dream. At least this one is easy access, you should see the spin on filter on my ST1300! See Filler Plug/Dipstick Location. Loosen the dipstick. Hold the motorcycle upright for one minute. While continuing to hold the motorcycle upright, remove and wipe off the dipstick. Insert dipstick into oil filler hole, screwing dipstick in completely. See Filler Plug/Dipstick Location. Unscrew and remove dipstick and note oil level. An indicated oil level between MIN and MAX is acceptable for safe engine operation. Oil should be added in 3.4 fl. oz. 0.1 L increments, depending on how far the level is from the MAX reading. If oil was added, proceed to the Oil Level Hot Check procedure. Ride motorcycle for approximately 10 minutes. Ride at least 5 miles (8 kilometers) to verify the oil is hot and the engine is at normal operating temperature. Readings taken with colder oil could lead to an overfull engine condition. Stand the motorcycle upright (not leaning on sidestand) on a firm level surface. An uneven surface will produce a false oil reading. Idle the motorcycle for three minutes. Shut off the motorcycle. Wait for 3-4 minutes after shutdown (with vehicle still upright) before reading the oil level, or false readings may result. Unscrew and remove dipstick from oil filler hole. Wipe dipstick clean. See Oil Dipstick Proper Operating Range. Unscrew and remove dipstick and note oil level. An indicated oil level between MIN and MAX (measured after performing steps 1 through 7) is acceptable for safe engine operation. Oil should be added in 3.4 fl. oz. 0.1 L increments, depending on how far the level is from the MAX reading. Confirm oil level by repeating steps 1 through 8. NOTE: If the oil level is at (or above) the OVERFULL mark, drain oil at 6.8 fl. oz. 0.2 L increments until the oil level is between the MIN and MAX marks on the dipstick. Repeat steps 1 though 8 to confirm proper level. 9. Hand tighten dipstick into oil filler hole. It will be interesting to see how the new for 2010 sight glass will figure into the oil level verification scheme. Does anyone actually ever get the same result from a cold and hot check... I never do. They hot says too much and the cold sometime shows perfect, sometime shows nothing on the stick. I was into the dealer a while ago and they removed a wack of oil for me as another dealer had way too much, later I checked it again and it still had too much, they took some out again. Yes, quit checking it and ride. Thanks Froggy, but how would I actually know if I had too much oil or not enough. I am at the point where I may just drain it and put it in myself so I know forsure. I guess I can also use a 10/40 since it is getting cold in canada.